We eat a lot of salad in the Dana Treat house. Almost every night that I cook, I make a salad. It is usually simple with just lettuce with some essentials (tomatoes, mushrooms, avocado) and a rotating list of favorites (hearts of palm, olives, chickpeas, pea sprouts). The stuff to lettuce ratio is always heavy on the stuff. I don’t love lettuce-y salads. And sometimes I don’t want lettuce at all. Sometimes I want something light and crunchy and nothing like my regular salads. That’s when I make this one. 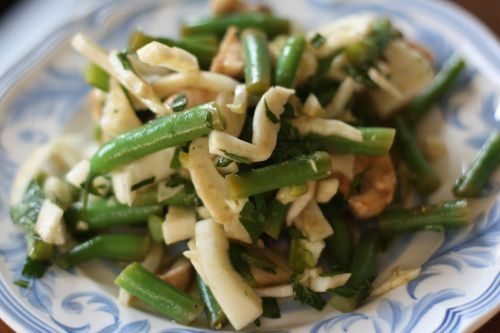 Blanched green beans, thinly sliced fennel, and mushrooms get tossed in a lemon balsamic vinaigrette with lots of herbs. It’s really a lovely salad when you want something cold and crisp but don’t want to wrestle with lettuce. This recipe originally called for a lot of parsley. I toned it down here a bit. Next time I make it, I am going to add some tarragon to the mix because I think it’s slightly anise-y flavor would be most welcome. Whisk first 3 ingredients in medium bowl to blend. Season with salt and pepper. I’ve never tried fennel, crazy, I know! This salad does look very refreshing and I do like my salads without lettuce. What a delicious combination. Love them both, though never combine them together. I will though, after seeing your post. 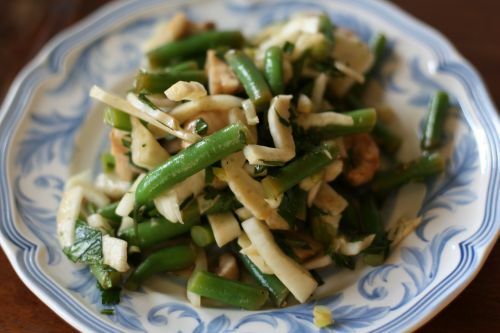 I love fresh green beans in a vinaigrette like this! Sounds great with the fennel too. We usually eat salad too but most of the time it’s just lettuce (well recently it’s been spinach). I love salads like this one you’ve made though so I should try making this kind of salad more often! Looks delicious. what a great combination! that looks delicious! The mushrooms are missing from the ingredient list. Please assist. Recipe looks GREAT! Dana- don’t know how I missed this one in the archives, but a friend made last week when I was over for dinner and I loved it! made it again tonight with fresh local beans/fennel– wow. Made this tonight with 1/4 the fennel (all I had), a dried mushroom spice mix instead of fresh, and with some mint thrown in with the parsley – delicious!